Medieval history in general and medieval castles in particular hold a great fascination for many people. Do you or does someone amongst your friends or family fall into this 'interest' category? If so, then buying Christmas gifts for them to enjoy is not that difficult. You can choose from a wide selection of medieval history books online and there's plenty of medieval style jewelry as well if budgets allow. Some castles even sell their own, individually branded castle gifts. Eastnor Castle in England is a great example. A fairytale, mock medieval castle with stunning architecture, the castle is set in a wonderful setting in the English Malvern Hills (Edward Elgar country). It is in great demand as one of England's most romantic wedding venues and stages some high profile, outdoor public events such as The Big Chill and Mud Runner. 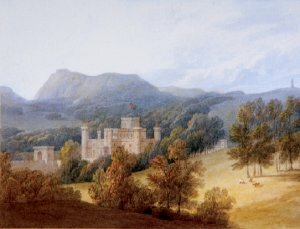 Romance, character and history all rolled into one, Eastnor Castle is a great place to visit - but what if you can't get there? What if you are at the other side of the world? Well, this is where the Castle Online Store comes in. 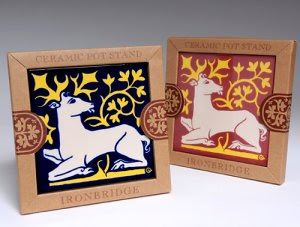 Amongst the super gifts you can buy are a mounted print of the castle (see picture above) and ceramic pot stands (right) decorated with the Pugin deer design from Eastnor Castle's drawing room fireplace tile. There is a range of gifts for all ages and any time of year in fact, not just Christmas ... so that's a few birthday presents sorted as well!